You've started creating Content or Marketing Messages or Posts aka Blogging (all are used interchangeably) in Locable and you'd now like to show it off throughout your website. GREAT! The Content Feed Component allows you to add a content feed to any page on your site, more than that you can customize feeds on each page to show just the right content. That is, the right content types and the right based on content theme. Start by adding the Content Feed Component to a page and placing it where you'd like to appear. For instance, at Locable we create content across a range of topics and some of that content is relevant to our Marketing Platform. Thus, we can filter to only show content related to Marketing Features on our marketing pages that promote specific features so there's a high degree of relevance. 1. 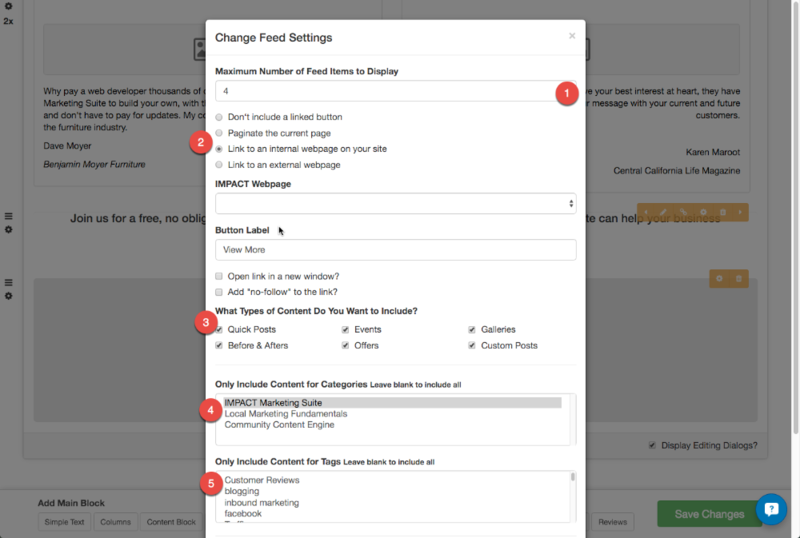 Maximum Number of Feed Items to Display - You can select the number of marketing messages to show in the feed on this page, it defaults to 4 on most pages though you can increase or decrease that number. Don't add more than 12 or 15 to a page as it slows page load time. 2. Handling Extra Posts - Next, you choose what you'd like to happen in the event that you have more marketing messages than the number specified to appear in the feed. By default, Locable will ignore additional posts as set by "Don't include a linked button" however you'll like want to change this setting. In most cases, you'll want to "Link to an internal webpage on your site" as shown above. The best practice here is to either link to your /blog page or create a new custom blog page to match this feed, in this case the widget filters will be identical to the page however the page will be dedicated to content rather than simply showing a few recent posts. You can choose the "Paginate the current page" however you should only do that for those custom blog pages we just mentioned otherwise it creates an odd experience for the user. Finally, you can also choose to link to an external website, blog, gallery, portfolio or other destination but this is not usually recommended because it means you have to duplicate a lot of effort. 3. What Types of Content Do you Want to Include? - This allows you to filter based on content types. In some cases, you may want to show just Galleries or perhaps just Quick Posts or Before & Afters or any combination for that matter. Leaving all checked will include all content types. 4. Only Include Content for Categories - This allows you to narrow the content to the Categories selected. You can select multiple categories (use ctrl+click on PC, cmd+click on Mac) or leave blank to default to all Categories. 5. Only Include Content for Tags - This behaves exactly the same as filtering by Categories but gives you more granular control as tags tend to be more nuanced and specific. Learn more about Categories & Tags.